1. Climate Change: with a 90% degree of certainty, the world's top scientists believe that our planet's climate is changing at an accelerating pace, that these changes are caused by man, and will have increasingly severe consequences for our world. Naysayers stress the 10% scientific probability that man is not the cause of current climate changes, but would you board a plane if you were told it had a 9 out of 10 chance of crashing? It is a rare person over the age of thirty who will tell you that the weather is not quite different now from when they were a child. Certainly far more erratic, though not necessarily always hotter. Recent estimates by a collaborative team of climate scientists, including a group from MIT, calculate that even if we implemented the most stringent greenhouse gas limits currently proposed by some of the world's governments, it is quite likely that our world's climate will warm by 6.3F or more over the next century, leading to disastrous crop failures in most of the world's productive farmlands and "breadbaskets". 2. Peak Oil: Our global economy and culture are built largely upon a reliance on cheap oil. From the cars we drive, to the jets we fly, to the buildings we live in, to the food we eat, to the clothes we wear--almost everything that encompasses the fabric of our modern life is either powered by oil, built from oil, or made/grown via machines powered by oil. When the price of oil rose to $140 a barrel in 2008, the world's economy went into a tailspin--collapsing local economies, reducing consumption, and bringing the price of oil back down to a fraction of what it had been just a few months earlier. Global output of traditional crude oil peaked around 2005-2006 and is currently declining. Expensive alternate oil and oil-equivalent sources, like tar sands, deep ocean oil wells, and bio fuels have taken up the slack for the time being, but these are limited resources and their utilization is not growing as quickly as anticipated to fill in the gap caused by the shrinking output from the world's mature oil fields. In 2008 the International Energy Agency (IEA) estimated that decline at a rate of the world's mature oil fields at 9.1% annually, with a drop to "only" 6.4% if huge capital investments are made to implement "Enhanced Oil Recovery" technologies on a massive scale. Without developing energy alternatives at warp speed, or discovering and developing an entire Saudi Arabia's worth of oil every few years from now until eternity (an impossible fantasy), our world will be in a heap of trouble if and when the economy starts to pop back and supply once again falls short of demand, resulting in more oil price spikes followed by another round of crashes. 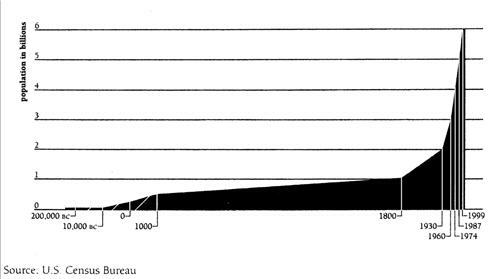 In the mid 1960s, when discoveries of new oil reserves reached their historical peak, we were discovering oil at a rate four times faster than we were consuming it. In recent years, the tables have turned. With technology that is miles beyond what was available in 1960, we are discovering about 1/10th as much oil each year as we did then, but consuming it at a rate five times faster than we discover it. That's like charging $100,000 dollars on our credit cards each year, and only paying off $20,000. How long can we keep that up before we bankrupt the system? 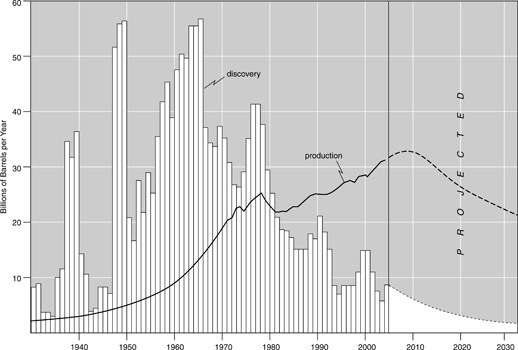 For years, governments have been official naysayers about the "Peak Oil theory". However, in April the US military issued a report saying, "By 2012 surplus oil production capacity could entirely disappear, and as early as 2015, the shortfall in output could reach 10 million barrels per day." 3. Collapse of the World's Oceans: with 11 out of 15 of the world's major fisheries either in collapse, or in danger of collapse, our world's oceans are in serious trouble! The ocean's planktons form the bottom of both the food chain and the bulk of the carbon-oxygen cycle for our planet. According to a recent British government report, the oceans have lost 73% of their zooplankton since 1960, and over 50% of this decline has been since 1990, and the phytoplanktons are also in serious decline! Unfortunately, the coral reefs aren't doing much better than the planktons. By 2004, an estimated 20 percent of the world's coral reefs had been destroyed (up from just 11 percent in 2000), an additional 24 percent were close to collapsing, and another 26 percent were under long-term threat of collapse. 4. Deforestation: Over 50% of the world's forests have already disappeared, and much of the rest is in threatened. Deforestation contributes approximately 25% of all global greenhouse gasses, nearly double the 14% that transportation and industry sectors each contribute. 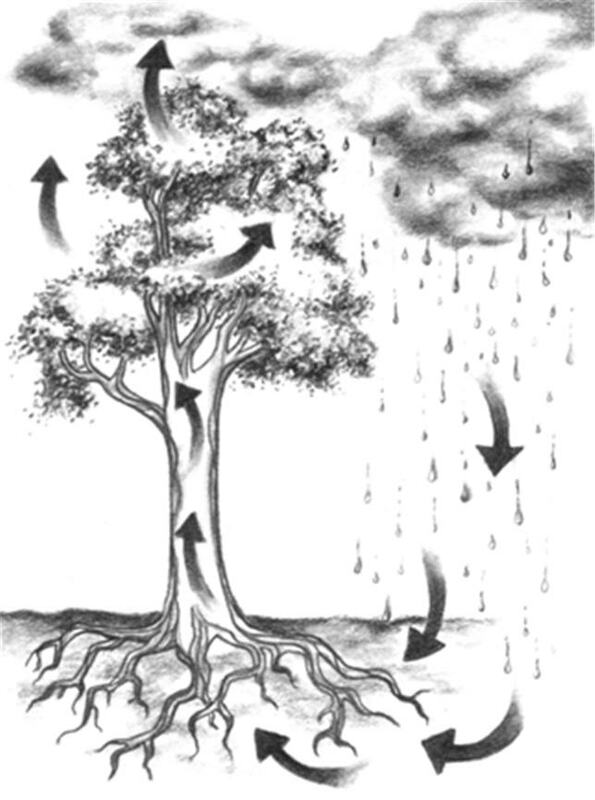 Additionally, the forests of the world are a critical part of the weather cycle as well as the carbon-oxygen cycle. Each large mature tree acts as a giant water pump, recycling millions of gallons of water back into the atmosphere via evaporation from its leaves or needles. It has been estimated that a single large rainforest or coniferous tree has an evaporative surface area roughly equal to a 40 acre lake. When the trees are decimated in a region, a process called "desertification" tends to occur downwind because the trees are no longer there to pump groundwater back into the atmosphere to fall back to Earth as additional rainfall at some down wind location. 5. The Global Food Crisis: Soils, Weather and Water. For the first time since the "green revolution" started, our world is producing less food each year, yet its population continues to rise as we loose more top soil, arable land, and have less water for irrigation. Climate change is currently contributing more to losses than technology is to gains. In 2008 and 2009, food riots threatened the stability of many governments. In 2010 extended droughts in the breadbaskets of both China and India are threatening the food supply for over 1/3 of the world's population! 6. Over Population: This is the elephant in the room that few are talking about. In the last decade, we have added more people to the population of our planet than were added between the births of Jesus and Abraham Lincoln. In the mid 1980s our world first overshot its capacity to provide for its human population, yet this population continues to grow and we continue to live on borrowed time. One thousand years after Jesus walked the Earth, human population was around 1/2 billion. Eight hundred years later this population doubled to 1 billion. It took only 130 more years to double to 2 billion in 1930. When I was a kid in 1960, world population hit 3 billion people and it only took another 40 years to double to 6 billion in the year 2000. It is anticipated that the world's population will reach 7 billion in the year 2012, meaning that between the start of the year 2000 and the end of 2012 (barring some huge catastrophe that kills hundreds of millions), more people will have been added to the population of our world than lived on the entire planet just two hundred years ago! There is simply no way we can achieve a sustainable future unless our population stops growing and starts shrinking. Either nature will do this for us, with starvation and plagues spreading across the planet as our natural and man-made systems fall apart, or mankind will use its intelligence and free will to proactively implement positive solutions to these issues. My intention is not just to bum you out, but to do my part in sounding the alarm for a massive wake up call to start taking the sort of wide ranging actions that will be required in order to succeed in changing the course of our "Titanic" (planet Earth) to dodge the iceberg of global collapse. Averting collapse will not be easy, but it is far better that the alternative! Highly motivated societies have shown that they are able to marshal huge forces to accomplish great things. When Hitler joined forces with Mussolini and Japan, the threat was great enough to unite the Russians and Americans with the rest of the world in a common goal. If we could put humans on the moon, build the Panama Canal, defeat Hitler, and rebuild Europe after WWII, why can't we unite to create a viable planetary civilization? So far, we lack not the means, but only the will and the leadership. In general, people lead and governments follow. It took massive action on the part of millions of people in the abolitionist movement to finally put a candidate in power (Lincoln) who was willing to do something about it, and for the suffrage movement to finally force governments to grant women the right to vote. Though none of us will individually alter the course of the universe, collectively we can do this! Just as the German people were asked how they could have allowed the Holocaust to take place before their very eyes, do we wish to be held accountable by future generations for allowing the approaching "Perfect Storm" to devastate our world while we had the knowledge and technology to change its course?